In Sumerian mythology, the “Tablets of Destiny” or “Tablets ME”, were a computer library consisting of a set of chips that contained all the information on war tactics, star maps, navigation routes and also, were the key to Activate or neutralize all the Anunnaki spacecraft. When these ” beings from heaven ” arrived on our planet, seven main cities were initially built, which would be the strategic points of Enlil’s plan to carry out his mission on Earth. These cities were located in present-day Iraq, between the Tigris and the Euphrates. In the region currently known as Mesopotamia. Then, the Anunnaki called the Edin region. That in later cultures the name derived in Eden. After Eridú “place in the distance”, the first Anunnaki settlement on Earth, and commanded by Enki, the city of Bad Tibira was built, which means “bright place where the mineral is finished”. This city was commanded by a son of Enlil, Nanna. Without “male moon god”.When Anu gave Enlil command of the mission on Earth, Enlil sent Earth to his sons Nanna.Sin and Ninurta. And next to them came Ninhursag, Enlil’s stepsister, his mistress, and Ninurta’s mother. It was in this city where Ninurta had her twin sons Shamash and Ishtar. The next city that was built was Laraak “seeing the bright glare”. It was a beacon city whose function was to guide space shuttles through a corridor of lights. This city was commanded by the other son of Enlil, Ninurta. The fourth city that was built was Sippar “bird city”. A very important city, it was a spaceport where the space ships departed with the cargo of gold. This city was commanded by Shamash “God of the sun and of justice”, grandson of Enlil. The next city was Shurruppak “place of supreme well-being”. It was the medical center of the mission and led by Ninhursag. The sixth city would be Nippur “the terrestrial place of Nibiru “. It was the control center of the mission and was led by Enlil, the supreme commander of the mission. In this city was also the transmission center with its home planet, Nibiru, and with the space shuttles that orbited the Earth, the Igigi . It was a bright chamber called Dir.Ga “the sacred one among the sacred ones” located at the top of a tower with several antennas called Dur.Aki “the sky-earth link”, as can be seen in the following Sumerian representation. The seventh city that was built was Lagash “seeing the halo in six”, first city beacon that would guide the flight route from Nibiru. In Nippur, the Tablets Me or “destination Tablets” hidden in Dir.Ga. These tablets were approximately 60 units, and were a kind of microchips that contained a source of vital information for the Anunnaki. These Tablets were the key to activate destructive weapons, control spacecraft, or direct any Anunnaki technological device, in addition to being depository of knowledge in laws, decrees to govern, technology, medicine, military techniques, defense methods, methods to submit to the population, and many more keys reserved for the Anunnaki elite. In the Sumerian texts there is a story called the ‘Myth of Zu’. An Anunnaki considered as a demon of a clan different from the rest. The origins of this being known as Pazuzu are not very clear. According to Zecharia Sitchin , the Igigi found Pazuzu when he was just a small orphan and they adopted him. They taught him all the secrets of space and how to use transport ships around the Earth. He was the God of the evil wind and the storms. He who was a carrier of plagues, pests and fevers. The Sumerians represented this being with a stylized body with bird claws on the feet, eagle wings, and a lion-like head. Although some physical characteristics could be reptilian. Pazuzu took cover in the Mountain of the Chambers of Heaven, Hursak.Mu. After the robbery, the alarms went off. Many of the Anunnaki devices, technologies and knowledge were rendered useless. Fear seized the Mission and the Anunnaki population on Earth. In the “Me” Tablets were the stellar routes where not only the orbits of the planets were drawn, but also the navigation coordinates of the Igigi ferries and the routes of their starships. Whoever owned the “Me” tablets would rule the heavens, the shipping routes to Nibiru. I would govern the Igigi , then. In this way he would govern the shipments of gold. That is, it would govern the Mission. And Pazuzu would rise as the new King on Earth. This was his plan. Fear and darkness rose in the Anunnaki of Earth. The Great Sovereign of Nibiru, Anu, commanded to capture Pazuzu and recover the Tablets of Destiny “Me”. Enlil summoned the Anunnaki for this purpose. But everyone feared to fail because Pazuzu had also stolen “El Enillo Glitter”, which must have been a type of weapon that made Pazuzu twice as lethal and impenetrable, and as powerful as Enlil himself. But the brave Ninurta, son of Enlil, took the initiative and went looking for him by arming his ship with the “Seven whirlwinds of wind that shake the dust” and a “Tiyu”, a kind of projectile. Ninurta defeated Pazuzu and recovered the “Me” Tablets. The order was restored. Pazuzu was sentenced to death and executed by Ninurta himself in a ceremony where they dressed Pazuzu as a bird because of his Igigi origin. This served as a warning to the Igigi.The only sovereign of the Mission and of the Earth is Enlil. Ninurta became the most worthy and main warrior of Enlil. And it was awarded by Anu and Enlil with new celestial cars and weapons. 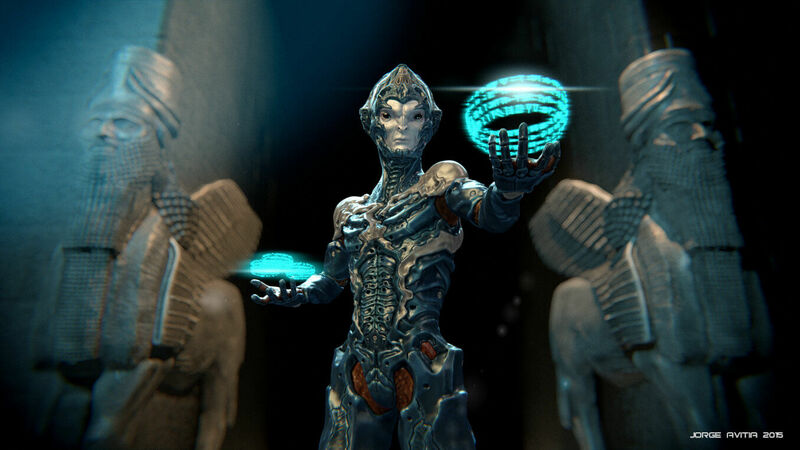 Enlil handed him the deadliest armor of the Anunnaki. The “Ip”. A weapon with 50 heads that kill. Pazuzu happened to become a mythological demon propagator of pests to the height of great creatures of the night like ” Lilith ” a demoniac goddess who usurped new born babies to their mothers to devour them. However, contradictory to what might be expected, the Sumerians used the figure of Pazuzu as an amulet against sorcery and as a protective talisman against the demons that at night brought babies out of their cribs to drink their blood ..